Diverting electricity and tampering with electrical wiring can lead to house fires. The use of extra exhaust fans in the grow operation can accelerate the fire, increasing the hazard. This hazard extends not only to the house where the indoor marihuana grow is located, but also the homes surrounding it in the neighborhood. Overloading the power system can cause hydro transformers to blow, resulting in power outages in entire neighborhoods. The re-venting of the furnace to circulate air to feed the marihuana plants can circulate exhaust fumes from the furnace back into the house. There can be a build up of poisonous gases from the chemical nutrients used in the production of the marihuana crop. These poisonous gases are circulated inside the house and also vented to the outside and released into the neighborhood. 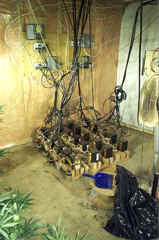 The combination of solvents and oxygen from the exhaust fans in “weed” oil extraction labs can cause an explosion. The ability for the growers to make massive profits prompts them to arm themselves to protect their operation. There is increasing evidence of kidnappings, extortion and home invasions linked to the marihuana grow industry. Often residences that house indoor marihuana grows are booby trapped to target unauthorized entry (e.g., live wires on door handles, spikes exposed in entranceways). This can cause injury or even death to emergency responders (firefighters, paramedics, and police), newspaper carriers, or innocent children who happen to wander onto the property. 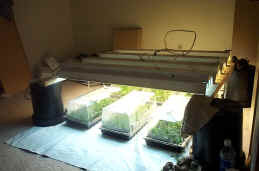 Often the houses that are rented for indoor marihuana grows are altered to be able to grow more product. Foundation walls are drilled through to facilitate illegal wiring. Unhealthy mold and fungus caused by condensation builds up inside the house and can eat through the roof of a house in only a few years. Many times, these homes cannot be renovated and must be destroyed since they are unsafe to inhabit. 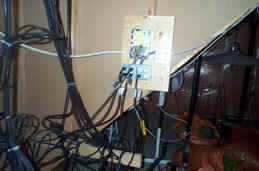 Electrocutions have been caused by rewiring the electrical system by people who don't know what they're doing. Young children can ingest the noxious fumes. They can also fall into and get trapped in the large vents used in the indoor marihuana grow operation. Indoor marihuana grow operations require massive amounts of water and hydro. To prevent detection, the growers steal the hydro and the water. They tap into and redirect the systems that bring these services into the house and tamper with the meters that measure consumption. The cost to cover the higher consumption of electricity and water is passed along to all consumers. Chemicals (e.g., fungicides and pesticides) are disposed of down household drains into our water system. Homes made to look lived in by things like light timers, but very few people are seen coming in and out of the home. Late night or very short visits by people. Strange smells or overpowering smells of fabric softener. 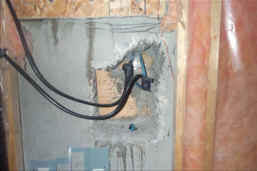 Water lines and/or electrical cords running to the basement or outbuilding. Unusual noises such as hammering or drilling into the basement foundation. People bringing unusual items into the house, such as bags of soil, lots of plant roots and potting plants. Excess potting soil or other growing mediums around the residence or in the immediate area. People continually bringing items and taking items away in garbage bags. Windows that are always covered. Residence or outbuilding has unusual amount of roof vents or exhaust fan noises. Outbuildings that have air conditioners. A house rooftop with no snow on it when the roofs of surrounding houses are snow covered. Little or no garbage being put out. People entering and exiting the residence only through the garage. People seen coming and going from the house only every week so. New neighbors never taking furniture or groceries into the house. House or utilities obtained under assumed names with payment made in cash. House rented under assumed names with payment made in cash. Purchase of very expensive heat lamps for unexplained reasons. Unexplained and unseasonably high utility bills. Property with excessive security (e.g., guard dogs, keep out signs, high fences, heavy chains and locks on gates). The building of a large green house or tin barn on property where these structures would not be normally used. Unusual amount of vehicular traffic (especially at night) carrying unknown individuals on and off the property with entrance gates always being locked after entry. Large purchases by individuals of fertilizer, garden hose, plastic PVC pipe, chicken wire, long pieces of 2 X 2 lumber, different sizes of pots (utilized for different stages of growing plants). Machetes, camouflage netting, camouflage clothing, various sizes of step ladders (up to 18 - 20 feet) usually painted with green and brown paint, green plastic garden tie materials, cans of green spray paint, large trash bags, lanterns, portable heaters (such as large kerosene heaters), extension cords, heat lamps and fans. Landlords may notice that tenants insist on paying their rent in cash; and while having no known source of income. These same tenants are reluctant to allow landlords to inspect their rented property. They make arrangements to meet landlords away from the property to pay their rent and/or to discuss any problems. Landlords should have a detailed rental agreement in place and ensure that the individual(s) renting their premises are those living there. References should be mandatory and checked. Members of the public are asked not to put themselves in any compromising position while obtaining information about marihuana grow operations or other criminal activity. If you observe a number of these indicators and suspect here is an indoor marihuana grow operation in your neighborhood, please contact the police at 204-986-6222 or Crime Stoppers at 204-786-TIPS ( 204-786-8477).